Floodwater in the Missouri River in 2011 originated in upper-basin regions and tributaries, and then travelled through a series of large flood-control reservoirs, setting records for total runoff volume entering all six Missouri River main-stem reservoirs. The flooding lasted as long as 3 months. The U.S Geological Survey (USGS) examined sediment transport and deposition in the lower Missouri River in 2011 to investigate how the geography of floodwater sources, in particular the decanting effects of the Missouri River main-stem reservoir system, coupled with the longitudinal characteristics of civil infrastructure and valley-bottom topography, affected sediment transport and deposition in this large, regulated river system. During the flood conditions in 2011, the USGS, in cooperation with the U.S. Army Corps of Engineers, monitored suspended-sediment transport at six primary streamgages along the length of the lower Missouri River. Measured suspended-sediment concentration (SSC) in the lower Missouri River varied from approximately 150 milligrams per liter (mg/L) to 2,000 mg/L from January 1 to September 30, 2011. Median SSC increased in the downstream direction from 355 mg/L at Sioux City, Iowa, to 490 mg/L at Hermann, Missouri. The highest SSCs were measured downstream from Omaha, Nebraska, in late February when snowmelt runoff from tributaries, which were draining zones of high-sediment production, was entering the lower Missouri River, and releases of water at Gavins Point Dam were small. The combination of dilute releases of water at Gavins Point Dam and low streamflows in lower Missouri River tributaries caused sustained lowering of SSC at all streamgages from early July through late August. Suspended-sediment ranged from 5 percent washload (PW; percent silt and clay) to as much as 98 percent in the lower Missouri River from January 1 to September 30, 2011. Median PW increased in the downstream direction from 24 percent at Sioux City, Iowa, to 78 percent at Hermann, Missouri. Measurements made in early January, when SSC was low, indicate that suspended sediment mostly was composed of bed material, but by mid-February, runoff from the plains caused PW to increase at most streamgages. Total suspended-sediment discharge (SSD) during water year 2011 at the selected streamgages in the lower Missouri River ranged from approximately 29 to 64 million tons. Total estimated SSD had the lowest exceedance frequencies in the reaches between Gavins Point Dam and Nebraska City, Nebraska, but exceedance frequencies increased substantially downstream. In 2011, total SSD with low exceedance frequencies were reported at Sioux City, Iowa, Omaha, Nebraska, and Nebraska City, Nebraska, despite moderate-to-high exceedance frequencies for annual average SSC, indicating that the duration of high-magnitude flooding was the primary driver of total SSD. Comparison of median SSC for samples from water year 2011 with samples in the 20 years prior indicated that median SSC for high-action streamflows (streamflows likely to produce a stage exceeding the National Weather Service’s “action stage”) in 2011 were lower than those typical for high-action streamflows. Multiple-comparison analysis indicated that median SSC values for low-action streamflows (streamflows likely to produce stages lower than the National Weather Service’s “action stage”) and high-action streamflows sampled in 2011 at 4 of 6 streamgages were not significantly distinguishable from median SSC values for low-action streamflows in the previous 20 years. Longitudinal comparison of streamflow and SSD exceedance frequencies for 2011 with corresponding frequencies for 2008 and 1993 indicated the important role of tributary contributions to total SSD in the lower Missouri River. In 1993 and 2008, tributaries were the primary source of floodwater in the lower Missouri River, which resulted in a 20-fold increase in total SSD from Sioux City, Iowa, to Hermann, Missouri. In 2011, releases at Gavins Point Dam were the primary source of floodwater in the lower Missouri River, and total SSD at Hermann, Missouri, was only twice that estimated for Sioux City, Iowa. Sand deposition was estimated using analysis of multispectral satellite imagery collected in October and November 2011. Distributions of sand in the flood plain of the lower Missouri River also were quantified in relation to distance from the banks of the main channel for seven discrete river segments bounded by Gavins Point Dam and selected downstream tributaries. The areal extent of overbank flooding and flood-plain sand deposits increased downstream from Sioux City, Iowa to a broad peak near Rulo, Nebraska, and then decreased to levels near the lower limit of quantification downstream from Kansas City, Missouri. Most of the flood plain inundation and sediment-deposition damage to agricultural fields was observed between river miles 480 and 700, where 2011 peak streamflows had low exceedance frequencies, and the lower Missouri River channel was less incised or had aggraded recently. As channel capacity increased in the downstream direction, the relative magnitude of the flood decreased downstream, and overbank flooding was less extensive. In the constricted reaches, flood-plain sand deposits mainly were observed in association with levee breaks. 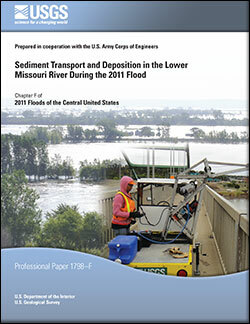 Alexander, J.S., Jacobson, R.B., and Rus, D.L., 2013, Sediment transport and deposition in the lower Missouri River during the 2011 flood: U.S. Geological Survey Professional Paper 1798–F, 27 p., https://dx.doi.org/10.3133/pp1798f.